This is what you would expect from a traditional Service with Hymns, Prayers, and Bible teaching from visiting Preachers. Holy Communion is included at regular intervals; you will see dates displayed on the Chapel Notice Board. The service concludes with tea and coffee with biscuits in the school hall. As the name implies, this occasional service has a cafe atmosphere and is held in the hall. The congregation sit in small groups around tables enjoying tea and coffee throughout the service which includes Hymns, Prayers, Bible teaching and discussion. If you like a more relaxed worship, this may be what you are looking for. This service takes the place of the Sunday worship once every two months. Meeting monthly on the first Tuesday throughout the year this is a sociable group of like-minded people who enjoy craft and company. There is always a chance to learn something new and current members variously knit and make handmade cards although ideas for different crafts are always welcome. There is a nominal charge which includes a cuppa. This afternoon group is another chance to get together with like-minded people. As well as an interest in craft the members share a desire to use their skills to help and support local charities. The group has a Christian focus and meetings start with Prayer before continuing with craft and chat. A programme of invited speakers provides further interest and has enabled us to understand more about the charities which we support. A small charge is made to cover heating costs and tea and biscuits. ‘Shell Group’ is the name given by the Methodist Church to all non-uniformed groups which meet during the week. This group is designed for children from 7-12 years old. The activities vary from week to week including energetic and quieter games, fun quizzes, cooking, craft and fieldgames on the Monson Playing Field during the Summer. There is a small charge for each child. THE LEADERS OF BOTH GROUPS OPERATE UNDER THE GUIDELINES OF THE HOME OFFICE AND THE METHODIST CHURCH CODE OF PRACTICE CONCERNING THE PROTECTION AND SAFEGUARDING OF CHILDREN AND YOUNG PEOPLE. 2014 marks the 120th year we have occupied this current site on the High Street in Skellingthorpe. 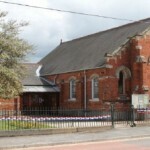 The chapel, school hall and the original vestry were built by a local builder, Mr Harrison of Lincoln in 1894. The previous chapel, which was situated on Old Chapel Road, had become too small for its expanding congregation. Today the chapel still thrives despite the smaller membership, with three styles of Sunday worship. The buildings are used by various village organisations virtually on a daily basis. Above all, the sound of God’s praise has continued to be heard from the Chapels in this village for centuries past and hopefully for millennia to come. To find out more about Skellingthorpe Methodist Church, or to enquire about hiring the church building, please head over to our contact us page or email skellingthorpe@lincolnmethodist.co.uk to contact the minister.